Ongoing documentation of artist Liam Crichton’s ECHO CHAMBER installation. 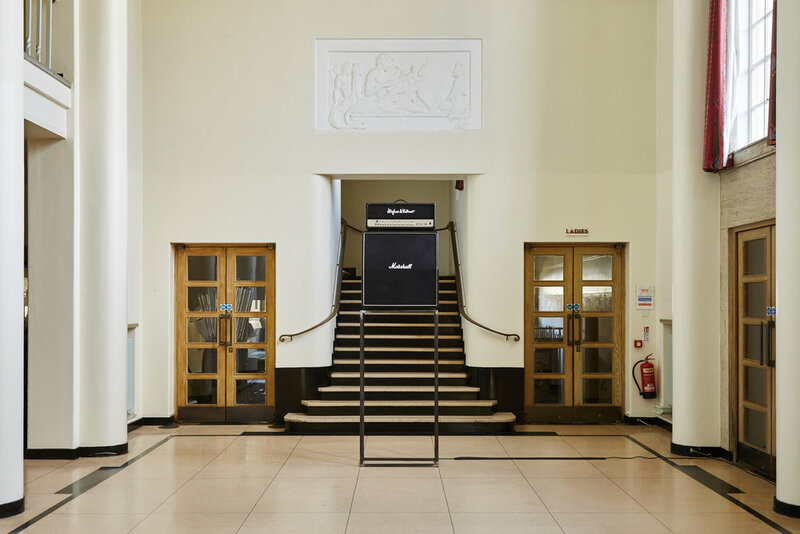 The work comprises a guitar amplifier stack on a mild steel frame plinth; through the speakers plays an installation score mixed from field recordings during a project to record in audio format the statues and monuments that surround Belfast City Hall. The historical site of City Hall has become the central focal point of the city, the city centre, a place around which all bus routes pivot, where diverse groups visit, congregate, meet, and protest, a thoroughfare. The building, which retains its function as a civil service office, has grounds that feature statues of Queen Victoria, various Lord Mayors, a Titanic memorial, and a large Cenotaph. These monuments are ornamental relics, museum artefacts based on powers and assigned memories of the past, showing contentious faceless figures. An everyday contemporary cultural significance is missing from such a prominent place. ‘Echo Chamber’ challenges the traditional notion of solidity and permanence in monumentation. The work communicates this through noise - a temporal, visceral medium devoid of symbolic emblems. 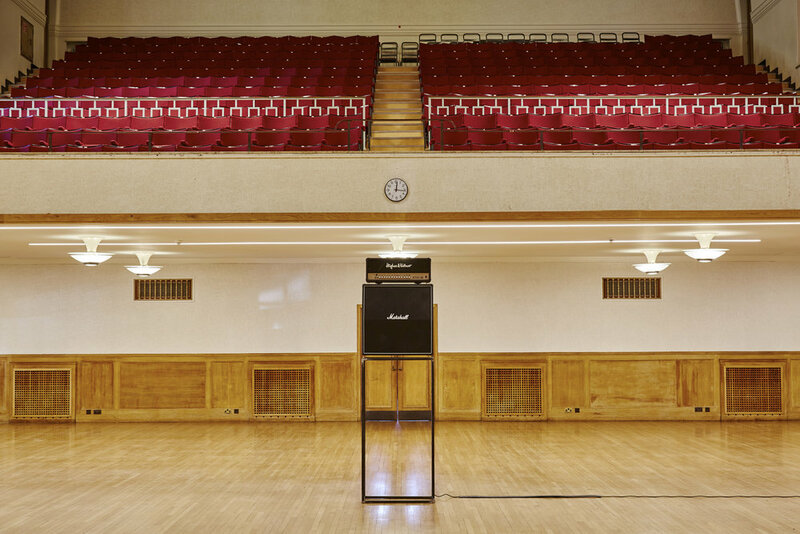 The form taken by the guitar amplifier stack gives reference to traditional ideas of physicality and scale in classical monuments, but also subverts them through the appropriation of counter cultural objects and, by association, with their historicity as a platform for an alternative voice in music, not defined by hierarchies of class, status, or gender, and unsanctioned by the state. This notion of subverted form is reinforced by the hollowness of the plinth, human-made in mild steel rather than stone - an everyday material more usually concealed within the structural fabric of the built environment. The sound piece is a collaboration with local musician Ricki O’Rawe, partly recorded using contact microphones directly onto the monuments at City Hall, is a dark, abstract soundscape. It is a pulsating rendering of the diurnal rhythm of the city; the cycles of public transport and the ebb and flow of people moving through the space, resonated through the cold and solid material of the sculptures. It captures the indifference and irrelevance of these monumental objects to the dynamism and life of the cities they inhabit. 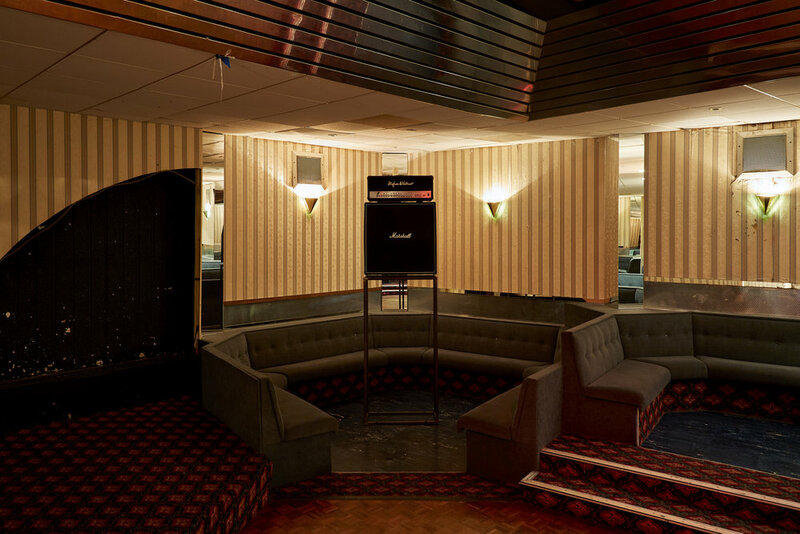 The title derives first from an enclosed space for producing reverberation of sound. But, it also makes reference to the media, which, like formal monuments, seeks to prescribe cultural identity from a position of power. In the media, information, ideas, and beliefs are amplified or reinforced through simulcasting inside an enclosed system, where different or competing views are censored, disallowed, or otherwise underrepresented. In a more general way, this immersive work investigates the materiality and temporality of the built environment, exploring urban landscapes with a particular attention to the conditions of emptiness. The work acts as a cypher for anxiety experienced around instability and impermanence and is a hauntological reminder of the mortality of the city. 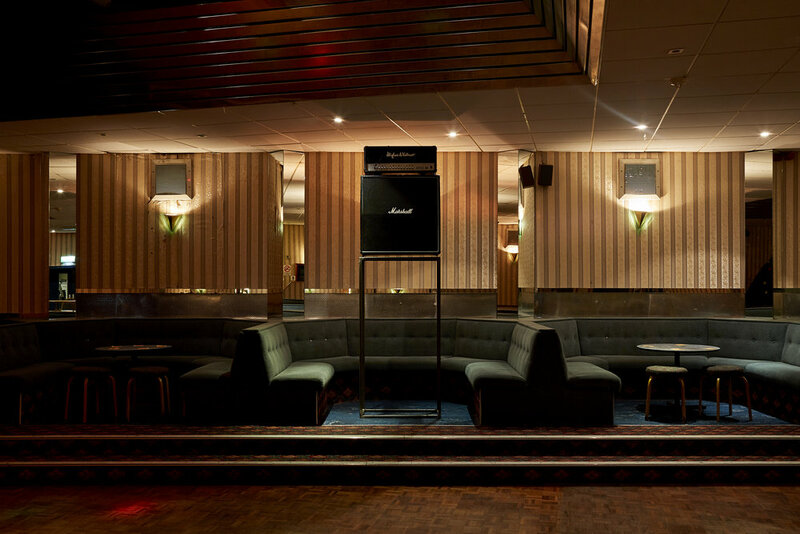 Echo Chamber is an ongoing work that is travelling around culturally important spaces such as deconsecrated churches, semi-derelict former banks, and working mens clubs in Belfast with the aim of becoming a 12’ book with record sleeve containing the sound piece in vinyl format.